Bob Schieffer covered American politics as a correspondent from the Department of State, Congress, and even the White House for more than 40 years, and yet he finds following news from Washington D.C. today more challenging than ever. Shieffer's new book is Overload: Finding the Truth in Today’s Deluge of News, which he discussed in the context of current politics during a visit to the Harvard University's Shorenstein Center. 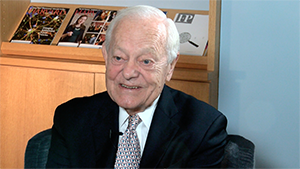 Hear Bob Schieffer's interview with WGBH News on politics today. Bob Schieffer is the former anchor and moderator of Face the Nation, CBS News' Sunday public affairs broadcast. He has also served as CBS News' chief Washington correspondent. Schieffer has covered Washington for CBS News for more than 40 years and is one of the few broadcast or print journalists to have covered all four major beats in the nation's capital - the White House, the Pentagon, the State Department, and Capitol Hill. He was chief Washington correspondent beginning in 1982, congressional correspondent in 1989, has covered every presidential campaign and has been a floor reporter at all of the Democratic and Republican National Conventions since 1972. In 2004, he was chosen as moderator for the third presidential debate. A member of the Broadcasting/Cable Hall of Fame, Schieffer was named the 2003 recipient of the Paul White Award from the Radio-Television News Directors Association. Schieffer joined CBS News in 1969 and, after a brief stint as a general assignment reporter, was named Pentagon correspondent, a post he held for four years. Before joining CBS News, he was a reporter at the Fort Worth Star-Telegram and, in 1965, became the first reporter from a Texas newspaper to report from Vietnam. Schieffer later became news anchor at WBAP-TV Dallas/Fort Worth, a post that eventually led to his joining CBS News. The author of three books, Schieffer's most recent book is Face the Nation: My Favorite Stories from the First 50 Years of the Award Winning News Broadcast. He is also author of the 2003 New York Times bestseller, This Just In: What I Couldn't Tell You On TV, and Acting President, published in 1989. Shieffer's latest book is Overload: Finding the Truth in Today’s Deluge of News (2017). Nicco Mele is the director of the Shorenstein Center on Media, Politics and Public Policy. He took over leadership of the center in 2016 after serving as senior vice president and deputy publisher of the Los Angeles Times.